Wellness Essentials Active is a personal nutrition to support the joint health and muscle strength. It is all about improving and strengthening the mobility, flexibility, and comfort of the body movement. Wellness Essentials Active nutritional packets will provide the extra nutrition you need to make these happen. It will keep up the body vitality and also keep it active as well as healthy. 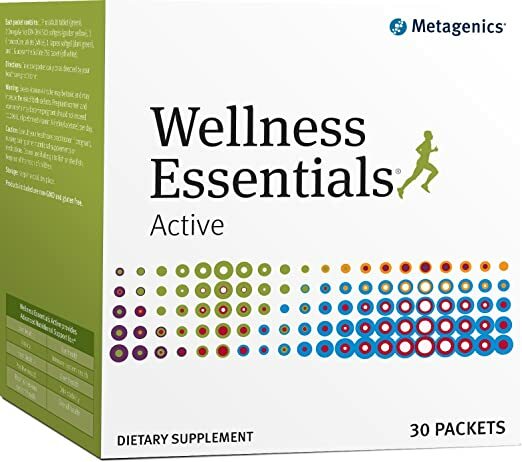 Wellness Essentials Active supplement is by Metagenics and it comes in packets with enough tablets and also capsules for each day. These nutritional supplements are easily absorbable into the body and get to work as early as possible. Joint support is the foremost benefit of Wellness Essentials Active supplement. It has special formulation for the support of the connective tissue with nutrition like the glucosamine, methyl sulfonyl methane, chondroitin etc. Provides Joint pain relief by the special combination of the many herbal components in it which comes in capsules. Healthy cartilage support is another benefit due to the support to the cartilage tissue and the presence of some other compounds. Multi level health support is another benefit of Wellness Essentials Active that maintains and protects the cells and even the stability of DNA. These factors can activate or reactivate the positive health to make the body capable of fighting any disease. Maintains Heart health by adding the EPA-DHA that provides the omega 3 fatty acids. These fatty acids will control the cholesterol levels in the blood and improve the heart health and prevent any heart related diseases. The other health benefits of Wellness Essentials Active are better brain and nervous system health, better vision and eye integrity, strengthened immune system, helps liver with detoxification and maintaining the liver health, and in short overall health of the body. Wellness Essentials Active is a personal nutrition to support the joint health and muscle strength. It is all about improving and strengthening the mobility, comfort and flexibility of the body movement. What does Wellness Essentials Active contain? 1 Phytomulti tablet that is green in color. The phytomulti tablets contain phyto nutrients that protect the cells and DNA. It has bioactive plant compounds that can provide multi dimensional support. It can recharge the cells and body and also nourish it as it has vitamins, minerals and plant extracts. 2 EPA-DHA softgels that comes in lemon flavor with extra strength contain omega fatty acids to strengthen the heart health and prevent the diseases. 3 white tablets of ChondroCare which will support the joint health with its glucosamine sulfate and chondrotin sulfate. They maintain the cartilage health and provide antioxidant enzymes which will prevent further damage to the joint tissues. These compounds are in the easily absorbable form. 1 Kaprex softgel is in dark green color. It relieves the minor pain in the joints by influencing the signaling substances and also contains special combination of compounds to work this way. 1 off-white colored Glucosamine sulfate 750 tablet. This tablet strengthens the cartilage tissue and prevents the degrading enzymes that damage the tissues. Vitamins A, B6, B12, E, K, C, D3, lutein, resveratrol, riboflavin, niacin, folate, biotin, pantothenic acid. Herbal extract blend made from the extracts of Citrus bioflavonoid complex, green coffee bean, pomegranate whole fruit, grape seed, blueberry fruit, green tea leaf, bitter melon fruit, prune skin, watercress, cinnamon, Indian gum Arabic tree bark, Rosemary plant, and Artichoke leaf. Phytomulti tablets contain microcrystalline cellulose, croscarmellose sodium, cellulose, silica, stearic acid. Hyprocellulose, hydroxypropylcellulose, medium chain triglycerides,sodium copper chlorophyllin are used for the coating. OmegaGenics EPA-DHA softgels are made with marine lipid concentrate, gelatin, water, glycerin, natural lemon flavor, tocopherol mix as antioxidants, rosemary extract and ascorbyl palmitate. Kaprex is made with olive oil, glycerin, gelatin, water, yellow beeswax, sodium copper chlorophyllin for color. Glucosamine sulfate 750 tablets contain glucosamine sulfate potassium chloride, microcrystalline cellulose, cellulose, croscarmellose sodium, ascorbic and stearic acids, hypromellose, hydroxypropylcellulose and medium chain triglycerides. ChondroCare tablets are made with the same ingredients as the glucosamine sulfate with the addition of chondrotin sulfate. MSM, selenomethionine, zinc citrate, copper citrate, and manganese citrate. The dosage is to take the contents of one packet per day. You can divide the portions equally to have it with the 3 meals or take all of them at the same time. What are the safety and possible side effects of Wellness Essentials-Active? The safety in using Wellness Essentials Active for pregnant and lactating women is not established so it is better that they do not use it. The excess vitamin A, 5000 iU can pose a problem and may cause birth defects. There could be side effects due to the presence of fish like anchovy, sardine, and mackerel in Omega EPA-DHA softgels, and crustacean shellfish in glucosamine sulfate and ChondroCare tablets. Anyone allergic to any of these fishes will have allergic reactions after taking Wellness Essentials-Active supplements. People may suffer discolored teeth, unpleasant body odor, skin rashes, upset stomach, stomach ulcers and in worse case, liver or kidney failure. These can be solved by ensuring that you take enough food to compensate for the metabolism. Does Wellness Essentials-Active have any drug interactions? People who have hormone sensitive cancer will need doctor’s advice to take these supplements. Wellness Essentials-Active may have drug interactions with the anti coagulants so people who take blood thinning medications will need caution. How does Wellness Essentials Active work? The nutrients in the Wellness Essentials Active will be absorbed by the body and the natural appetite will improve. The body takes in more food and hence more nutrients are also absorbed which helps to recover from many deficiencies. The Wellness Essentials Active can make the cells demand from nutrients which increases the appetite. Since all the nutrients are in their easy absorbable form there will be little time wasted to make the body healthier. The increase in food consumption will not be affected as the body demands more nutrition and the calories can be used for energy production. How long does Wellness Essentials Active take to show the results? The minimum duration would be 3-4 weeks to show positive results after taking Wellness Essentials Active supplements. It may also tale longer time as the body needs time to accommodate and act accordingly. What are the advantages and disadvantages of using Wellness Essentials Active? The positive results can be seen in increase in appetite, food assimilation, improved food storage capability, and better blood flow due to the vitamins. With caution and enough physical exercises these problems can be easily solved.